How did you get interested in WWII Pacific aviation? How did you begin the researching the book? When was the first edition of the book was published? Why do you feel particularly qualified as an author? Have you traveled to places where the 345th served? How did you locate veterans of the 345th BG? I was born in 1944, and raised in Wichita, Kansas. My father eventually rose to Project Engineer (ie: supervisor of engineering for major company projects, ie B-47, B-52, AWACs) for the military division of Boeing. I was around aircraft all my growing up years, including working in the shops at Boeing during one of my summers. With Beech, Boeing, Cessna and later Lear Jet plants in Wichita, it called itself the "Air Capitol of the World." B-47s, and later B-52s were constantly in the sky over the subdivision where I lived as they came off the assembly lines at Boeing and then were flight tested from McConnell A.F.B., which was about 3-4 miles south of my home. The flight path for one of the main runways was only a couple of blocks from where I lived. This was back in the days when there was no noise dampering on jet engines, and the eight engines at full take off power on a B-52 going over at an altitude of few hundred feet was quite a memorable experience. And it went on several times a day for many years. It was something you couldn't forget, although it was just a part of everyday life. When I was in grade school, the teachers had to stop talking for a minute or so each time a bomber on a test flight flew over. You couldn't talk over the noise. I remember laying in bed in the middle of one night, when suddenly about 20 B-52s began taking off one right after the other as fast as they could get off the field. At that time, McConnell was also a Strategic Air Command base, and I just laid there as the planes roared over and wondered what had happened to scramble an entire SAC bomb wing in the middle of the night. Were we at war with the Soviet Union? Would the nukes start falling on Wichita soon? This must have awakened and scared the hell out of everyone in town. The sound litterally shook the house. Apparently it was just an exercise, because I never heard any more about it. Sure got your attention though in the middle of the night, even though you were used to regular single-plane test flights at night. How did you get interested in WWII and aviation? I've always been interested in aviation. When I was growing up, the WW II airmen were my boyhood heros. I built model airplane kits, and became greatly interested in the correct markings and insignia of these planes, and the history of the pilots who flew them. For a young person, I built a pretty extensive library on the subject. This has all just continued into adulthood, although I haven't built a model kit since I went away to college. My books, with their color profile paintings, hundreds of photos, and detailed historical accounts are my expression of that now. cursory, so I resolved then and there that when I grew up I'd research the history of the unit and do it right. Which I did. I graduated from Rockhurst College in Kansas City, Missouri in 1966, with a degree in History and Political Science. As a civilian, in 1966-7 I spent a year in Vietnam with the Directorate of Operations Analysis (Project CHECO), HQ 7th A.F., documenting the air war for HQ, US Air Force. Got to travel extensively from one end of Vietnam to the other, including visiting Army bases and field camps and even a Special Forces' Camp, and flew about 20 combat missions, mostly with the Forward Air Controllers but also once in a Skyraider. One thrill was flying directly over the first US Marine combat beach assault since WW II, which was part of Operation Hickory, the first invasion of the DMZ. Early the morning of the invasion, I was flying on a C-130 passenger flight from Danang to the Marine combat base at Dong Ha, just south of the DMZ, to observe the air operations in support of the battle, which also involved a large Marine force attacking directly into the DMZ, trying to catch an NVA division between the two forces, pin it against the Ben Hai River and wipe it out. bomb or shell craters, and a pattern of sparkles coming from the jungle next to the clearing. North Vietnamese AA gunners were trying to shoot down this lumbering C-130 which was passing overhead at maybe 4000 feet (it seemed like BB Gun range)! Our pilot immediately did a fighter plane peal off, which threw all of us around, then beat a hasty retreat. After we landed, the crew got out and searched for holes in the plane, but there were none. We didn't have a scratch. I often wondered what kind of a report the pilot filed after that flight. I wouldn't be surprised if he didn't bring the subject up. He probably could have been court martialed for what he had done, especially had the plane been hit. Sure was an interesting and exciting trip for me though. Pentagon. Pretty heady stuff for a 24-year-old. For the last two years in the NMIC I was the Political Analyst for North Vietnam, and was considered one of the top experts on Vietnam at the Dept. of Defense. into one covering the entire country. During the last year of my intelligence career I was also an advisor to the National Security Council Staff, attending regular meetings on Vietnam in the old Executive Office Building next to the White House. At the ripe old age of 28, as the war was ending, I resigned and moved to Colorado, where I really wanted to live and build a business career. Since 1973 I've been a private businessman, living for most of that time in Boulder, right at the foot of the eastern slope of the Rocky Mts about 20 miles NW of Denver. I was President of a small manufacturing Co. for about 20 some years, and concurently was involved in real estate development, and my aviation history and publishing business. At 57 I'm now semi-retired, spending a few hours a week managing my real estate holdings, while spending virtually full-time on my writing and publishing projects, including my "Eagles Over the Pacific" book series. While I was going to college in KC, in 1963 I started tracking down vets of the unit from a list of about 4600 WW II names and addresses in the back of "Warpath." From then on, everywhere I travelled, and all along the routes to anywhere I drove on trips and vacations, I'd track down anyone still in that area who had served in the unit, interview them and collect photos. I also began corresponding with some people who were not where I could reach them. Over the next ten years, I located and interviewed about 100 345th vets, including the first unit C.O. (and later the C.O. of 5th Bomber Command), who lived in Colorado Springs, where I initially moved in Colorado. In 1974, through this effort to contact unit vets, several of them decided to hold a reunion in Colorado Springs, and used my contact lists as the basis for locating their vets. The first reunion of the 345th B. G. was held in a motel right out the back door of the apartment I was living in, and they officially set up their reunion assocation, which eventually numbered over 1200 men. Obviously I was always busy with my tape recorder during their semi-annual reunions over the next few years. When was "Warpath Across the Pacific" Published? Since I had business experience, and knew how to do marketing, I decided to finance the publication of the resulting book myself, and borrowed the money to publish the first edition so I could do it the way I wanted, not the way an editor and/or publisher thought it ought to be done. 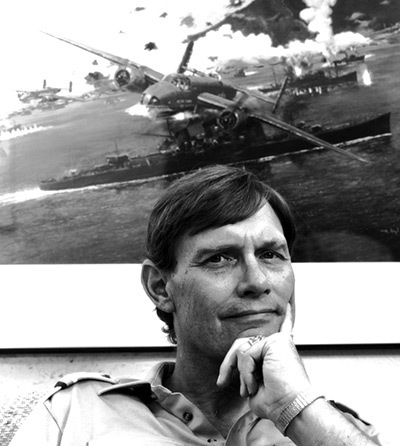 So, in 1984, I published my version of the 345th history, "Warpath Across the Pacific," which is presently in its 4th edition, and which many reviewers and readers consider the best history of an air unit in combat ever written. With a history degee, a background of researching and writing about combat aviation during wartime, plus my extensive intelligence background, [Vietnam Service] I feel uniquely qualified to apply all of theseelements to my WW II research and writing. I also know how to sort out the history from the "war stories," while still perseving the authentic content of the latter to provide insight into the personal experience of the story. I never create material or elaborate on it beyond the documentable facts. However, I think that I have a talent for weaving all the different source threads of the story into an account which is both dramatic, and intensely interesting. I've never been to Australia, New Guinea, or the Netherlands Indies. My experience of the Philippines is a stop over for gas and and aircraft servicing at Manila. Since a small part of the story of "Warpath Across the Pacific" involves French Indo-China (the part later known as Vietnam), I obviously am familiar of that country from personal experience. I'd also visited Hong Kong for a few hours, which briefly figures in the story. The truth is that I'd never been in a B-25 when I wrote the book, although I've since flown in them a few times. I could write a book on the process of writing the book. Tracking down key people to the story was a major challenge. When you're trying to cover hundreds of events and episodes over a period of four years, much of it in combat, it was essential to find key eye-witnesses to many specific events. I used some innovative techniques to find some of the people, long before today's internet world. Eventually, eye-witness information and/or detailed official documentation was found on every one of those events. The completeness of the account amazes even me to this day. The reason the book so accurately reflects the entire history of the unit is that I interviewed not only the officers and pilots, but people from the cooks to the C.O.s. In fact, the first interview I did back in 1963 was a cook in the unit. One interesting irony turned out to be the fact that one of the people I ultimately wrote about had briefly touched my life many years before in a tragic way. When I was a boy, about 10 or so, two B-47 bombers had a mid-air collision on a test flight and crashed about four miles east of my home in Wichita. I was in the car in our driveway with my dad and sister waiting for my mom to come out so we could go to a movie when suddenly two huge oily smoke clouds billowed into the sky behind the roof of our house. My dad, who was on Boeing's crash investigation team, knew immediately that a B-47 had gone in. We watched the huge plumes of smoke for a short while until my mom appeared, then went to the movie. Afterwards we drove out to one of the crash sites. It was now after dark and we could see the crash scene was still blazing fiercely, even though we couldn't get close to it due to all the emergency equipment and security. Both crews had been killed in the crashes. A few years later, my Boy Scout troop camped on the farm of one of the crash sites, and all of us ended up hauling home all sorts of small pieces of debries as souvenirs. Only when I was well into the research on "Warpath Across the Pacific" did I realize that one of the Squadron C.O.s, who later became the third 345th Group C.O., Col. Chester A. Coltharp, was the pilot of one of those B-47s that I'd watched burning and collected souvenirs from as a boy. One of the greatest satisfactions I received from the many favorable reviews and comments about "Warpath," came at the publishing party in held here in Boulder, in1984. Several veterans picked up their copies, then went off by themselves for a few hours to find and read sections concerning the time they were in the unit. Late in the afternoon, they came back as a group to talk to me and said that they didn't understand how someone who wasn't there with them could have possibly told their history so accurately and authentically. They just shook their heads and said until they actually saw it, they couldn't believe it could be done. Every one expressed the same sentiment, even though they represented different time periods of service, and different job descriptions. They each said that it was dead on with their experience of the events portrayed. That was the ultimate compliment to me. A couple of years after the book was published I was made an honorary member of the 345th B.G., and I was also made an honorary life member of the 500th Bomb Squadron Association. To this day, some 17 years later, I've never found anyone in the 345th who felt that the book did not accurately portray their experiences with the unit. A couple were bent out of shape that they weren't mentioned by name in the book, but that's about the extent of discontent. I had to tell them that I wasn't publishing a small-town phone book, and that having some 1700 out of 4600 who served in the unit mentioned by name in the book's narrative, acknowledgments and appendices was pretty good. You can't please everyone. I've had many, many letters and reviews telling me how good it was, best book on a military subject in the English language published that year, etc., etc. In fact, the only reviewer who had reservations was one expressed in a review in Japan, where the reviewer thought that it was an anti-Japanese book which exaggerated or even fabricated the negative role of the Japanese in the story. Obviously, I didn't take that one too seriously. I'm far from anti-Japanese, but the facts are the facts. Every episode of torture, brutality and execution in the book are thoroughly documented by Allied intelligence reports, forensic evidence or war crimes trial transcripts. Many family members of vets who died while with the 345th have contacted me, because much of the info in the book on casualty events was never provided to them. Without exception these people have expressed great appreciation that the info on the deaths of their relatives and loved ones was published and thereby their sacrifice for our country was acknowledged. One of the most touching incidents that happened was when I received a letter from a then newborn baby daughter of one of the POWs. She provided, in very moving and personal terms, how much knowing what had happened to her father during the war meant to her. The whole series of events told in the book had very tragic consequences for her family, and she'd never understood what had caused all that. Now she finally knew, and she profusely thanked me for giving her information and insight into these events of which she'd never known. In the case of another story involving one of the surviving POWs, I first talked to the man's wife when I finally located his phone number. He was not home at the time, so I told her who I was and what I wanted. She assured me she would convey the info to him, but stated that she didn't think I'd find out anything from him. She said that he would not talk to anyone about it, not even his family, and she doubted that I had a chance of faring any better. However, she expressed hope that he'd finally talk to someone about what happened to him. When I got ahold of him that evening, the result was the opposite. He told me everything in great detail, and answered all of my questions, many of which were quite personal. He then provided photos and very detailed and unexpected documentation of his experiences, which I considered one of the "must have" stories in the book. First I was astounded that the book became a classic in the field (I recently saw a signed first edition advertised on Amazon.com for $500.00. Should have saved a few extra copies. I knew it was good, because I had a very large aviation library to compare it to, but I would have been happy just to have earned back my printing costs, much less anything for all the production expenses and my time. The book was truly a labor of love. I had no idea it would ever sell beyond the 2000 copies of the first edition. Since it has been both a critical and financial success, I've plowed all the income from it back into other projects relating to 5th Air Force units, plus added a lot more from my personal income. When I finished "Warpath Across the Pacific" it was so much brain damage I swore I'd never write anything like that again (I was still working a full time job). However, so many vets requested that I do further histories that I eventually forgot the pain and suffering of doing a book like that, and started out again. I'm now nearing completion on five more books of comparable or better quality, although it has taken me much longer than I ever imagined. I do have rooms of material, not just on the 345th, but on most of the other 5th A.F., plus Japanese units. Largest archive in the world on the subject. 30,000 photo copy negatives of photos from many hundreds of vet collections. Have photos of probably 60-70% of all the aircraft that flew with the 5th A.F. during its career, including encyclopaedic coverge of about 8 Groups (this means nearly every plane that flew with the unit during its history). Don't forget, I've got "Warpath..." style histories far advanced on the 3rd, 22nd, 38th, 43rd and 312th B.G.s, in addition to the 345th. Plus very heavy coverage of many of the fighter units as well. I Am doing serious planning on where all this goes. Books by Lawrence J. Hickey and co-authors published by International Historical Research Associates (IHRA). Visit International Historical Research Associates (IHRA) to order Hickey's books and learn more.